The Zonnetuin Foundation is also supporting the quality of life of bees, the pollinators of our field crops and fruit trees. Worldwide, bees are severely weakening and die on a rapid scale. The causes of their collapse include industrial beekeeping, the use of chemicals and pesticides, artificial breeding of queens, feeding with white-sugar solution instead of honey over the winter, and electromagnetic radiation. The latter in particular is causing bees to become disoriented and entire bee colonies to degenerate. The imme, the spirit of the bees and their hive, has been forced to leave the Earth by pollution of the world ether, CO2 emissions, EM radiation and human ‘emissions’ of all our impure thoughts, words and actions (karma). The call from the Spiritual Worlds is that we must all become aware of this problem and to learn to attune ourselves in such a way that the connection with the imme can be restored. What can we do to keep the bees here, to live on Earth? Give the bees a round shaped hive. Hives can be woven from rye grass or purple moor grass or you can use hollowed-out tree trunks. Square/rectangular frames disturb the energy of the hive. Allow them to build natural combs. Artificial comb foundations force the bees to build unnatural combs that affect their true essence, their cosmic origins. Allow them to swarm naturally. Do not prevent swarming with interventions such as killing queens. Do not feed with white sugar. It makes them susceptible to a disease called nosema. Stop transporting bee colonies. 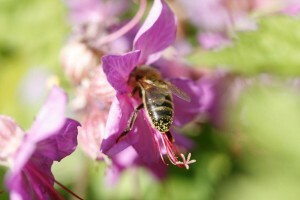 Bees are usually set out in remote locations for gathering special kinds of honey such as heather, clover or rapeseed. Do not use the honey for yourself or sell it to others. We should leave the honey with the bees, so that they can use it to survive the winter. Do not use cell/mobile phones in the immediate vicinity of the hives. Carry out any action affecting the bees during the proper constellations. The most important thing is that the bees are kept where people follow the rhythms of the cosmos in their work. Consult the agenda Het juiste moment or the book De mens tussen aarde en kosmos. Both (in Dutch only) can be ordered from the foundation.